Chromebook shipments will double during 2014 compared with 2013, according to data from ABI Research. During the first quarter of 2014, Chromebook shipments increased 67%, compared with the same quarter last year. Seventy-four percent of Chromebooks shipped during Q1 were manufactured by Acer, Samsung, and HP, the top three leading vendors. Acer controls 37% of the market, and ABI projects it will maintain the lead of market share into next year. 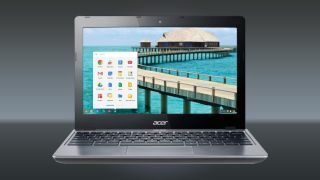 Two of Acer’s Chromebooks are listed in TechRadar’s “Best Chromebook” rankings. The Acer Chromebook 13 features a 13.3-inch 1080p resolution screen, and weighs 3.31 pounds, one of the lightest laptops on the market. We dubbed the Acer C720 Chromebook a perfect "homework machine" ideally suited for students and families. To learn more about the best chromebooks on the market, click here.